There are always these things that I keep coming back to. Faded destroyed jeans, vintage rock t-shirts, Van Morrison, Old Rasputin, the first Back to the Future movie, apple pie. It was one of those recipes that always felt perfect, even when it wasn’t. 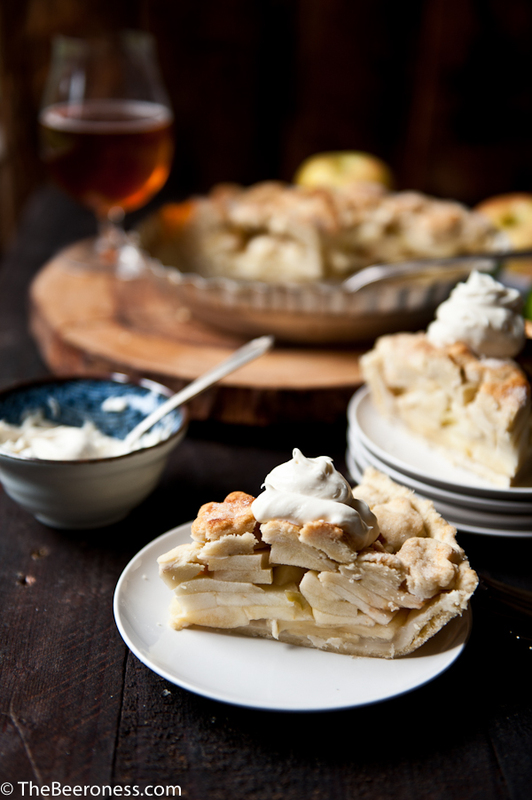 Even when the edges of the crusts were brunt, or the filling was runny, or the apples turned mushy, it was still apple pie. The tartness, the sugar, the cinnamon, the flaky crust, it was all there reminding me that it has been there all along. Through my lust for a complicated soufflé, my affair with Crème brûlée, that summer I was obsessed with pavlovas, apple pie has always been there. Always perfect, even when it’s not. Classic but never boring. Just as perfect at 8am as it is at midnight. 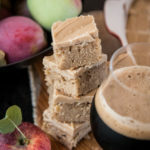 Perfect with a cold beer, and even better made with one. Or both. Always both. Add 1 ½ cups of flour, salt and sugar to a food processor, pulse to combine. Add the butter and shortening, process until well combined and dough gathers around the blade. Lay two long sheets of plastic wrap on a flat surface. Divide the dough evenly between the two sheets, Form into flat disks. Wrap each disk tightly in plastic wrap, chill until firm, about 1 hour. Add the apples (about 8 cups total) to a large bowl. Sprinkle with brown sugar, flour, cinnamon, nutmeg, lemon juice, 1 tablespoon beer and apple sauce, toss until coated. Roll out one of the pastry disks out on a lightly floured surface, line a 9-inch pie pan, trim off the excess. Roll out the remaining pie dough, cut with a small cookie cutter, layering the shapes over the filling. Brush with melted butter, sprinkle with sugar. Place pie in the freezer for ten minutes while the oven preheats. Bake the pie at 350 for 40 minutes or until the pie is golden brown. Remove from oven and allow to cool for at least an hour before cutting. In a small bowl combine the mascarpone, powdered sugar, vanilla and pale ale until well combined. Top the pie with cream prior to serving. 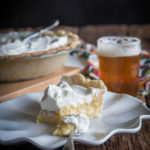 I don’t think I have ever paired pie with beer before, but that was clearly a mistake on my part! 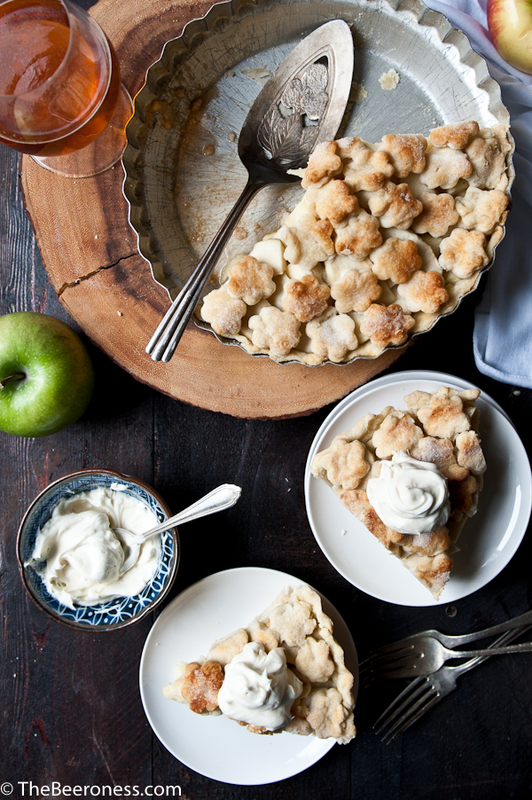 This pie looks so beautiful, and I love the sky-high layers of apple. Now this is an apple pie!! 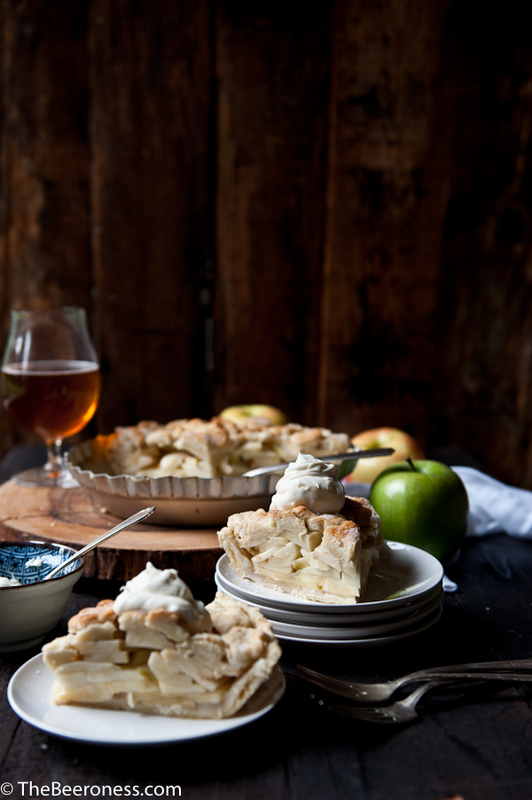 Loving everything about it – the height, all the stuffing and that incredible beer pie dough. Divine! 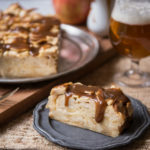 You used a pale ale in the crust and topping (sounds delicious btw) but what about a Hefeweisen? How do you think that would affect the flavors. Especially in the crust? I think it would be perfect in the cream. In the crust I use it as a vodka replacement, so the higher the ABV the better. It would really affect the taste of the crust at all. i made this this other day, and while i found the dough to be super ornery and difficult to work with, it was TOTALLY worth it. this pie is absolutely delicious. 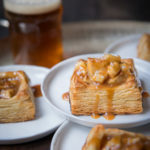 we are apple pie (and beer!) people ’round these parts, and i will totally make it again. Did anyone have problems with runny topping? I followed instructions and flavor is good, but it’s definitely like more of a drizzle than a whipped topping. Very soup-like in consistency. I’ve never had that happen before. Was the mascarpone cold? Maybe refrigerate it and it should set up. Next time try beating the mascarpone and the powdered sugar together first, then slowly adding the beer.